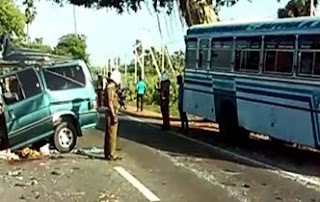 Three persons were killed and nine others were injured when a van and a bus collided head-on at Amithirigala in Ruwanwella last night. The Police said the driver and eight passengers of the van were admitted to the Awissawella Hospital and three persons aged between 63 and 68 had succumbed to their injuries. The deceased were identified as residents of Yakkala. The driver of the bus has been arrested.